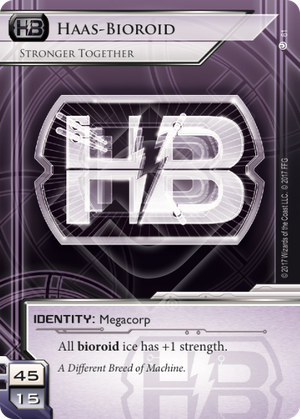 All bioroid ice has +1 strength. A Different Breed of Machine. When you get right down to it, Netrunner is a game of economy. The two main ways that this manifests are in better economy, and better economy. Kate and Engineering the Future are popular for the solid advantages they provide, and NEH's card drawing provides an excellent advantage. There is another way to approach the matter though; rather than focus solely on your own economy, you can attempt to disrupt your opponents'. Replicating Perfection is popular for this; to run certain targets, you need to run twice, which wastes both s and s. Several Anarch builds also capitalise on resource denial, which is a facet of this. Which brings me to Haas-Bioroid: Stronger Together. The identity has the standard 45/15, and the ability to make all bioroid ICE a small bit tougher. It seems like a simple ability, and I've often heard it called underpowered, but I firmly believe that it has further-reaching consequences than one short sentence implies. On the surface, people look at the ability and say ‘at best, it costs them 1 extra to break a piece of ICE, or they can just click through it.’ The first point perhaps seems lacklustre compared to EtF’s solid credit, but it is actually 1 extra credit per ICE, so the gap between the two is not quite as wide as imagined. To the second point; this is true of almost all bioroids, and yet I would hazard that Eli 1.0 is the most popular barrier in the game, save perhaps Wraparound. This is because Eli 1.0 is taxing under any circumstance; to break it with a Corroder, you need to spend 4 or 2. Clicking through is ideal for the Corp here; a runner can have any amount of money, but can only have a limited number of clicks. Using Stronger Together as an ID increases the credit cost, which slightly inclines the runner to spend clicks. Both of these options are indirectly attacking the runner’s economy, and as such it is easier to make an extremely taxing deck with ST than any other HB identity. Imagine a hypothetical server protected by Eli 1.0 and Viktor 1.0, facing a runner with Corroder and ZU.13 Key Master: It will cost you 6 to rez both. It will cost the runner 5 to break either ICE. This strategy has recently gained some excellent pieces of support, such as Enhanced Login Protocol, Heinlein Grid, and Inazuma, all of which increase the taxation exerted. An important point often overlooked with ST are the ‘indirect’ effects; those which only appear when you include other cards in the comparison. Viktor 1.0, for example, becomes un Yoggable. Heimdall 2.0 cannot be broken by Knight. All the ICE becomes more resistant to Parasite. Atman faces a conundrum: if at 4, you start needing Datasucker tokens just to break Eli 1.0 and Ichi 1.0. If at 5, it is still expensive for conventional breakers to deal with Markus 1.0 and Viktor 1.0.